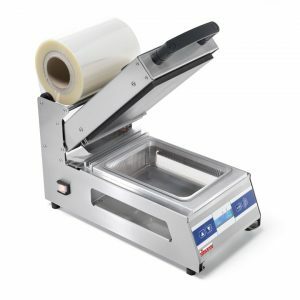 A practical and easy to use manual tray sealer. Perfect for packaging frozen meals, pasta, deli produce, etc. Indispensable for use in supermarkets, deli’s, grocery stores, sandwich bars, etc. Robust AISI 304 stainless steel body. Electronic controller with temperature and preheating controls. Maximum tray size: 260×190 mm. Custom dies made to drawings. Teflon coated aluminium sealing plate. Maximum film width: 200 mm.